You can add QR activations into the rogain game in several ways. This brings excitement and/or enables to add other tasks and items, that can be done anywhere and at any time, among location based questions. How to do that? First, clone a rogain or create a new one. Add on the map the pins for questions that are location based or just questions you want people to answer at certain spots. 1) Create a new question. Write the question Intro (set under questions` comments and clues tab) Find a dog and only then scan this QR code to open up the time-limited challenge! 2) Add question text: Lovely, you have found a dog! Now squat with the team around him/her and sing the happy birthday song to the dog! Shoot a video as a proof! Hurry, you have 3 minutes! 3) Make the pin icon and radius invisible in the question’s additional setting tab- then you can later put the tasks on the map but these won’t be visible for players. 4) It is reasonable to add a timer to the question- like a couple of minutes. So, only the teams who have found the requested object can do the task successfully. Brief this nuance to the players in game’s welcome text! 6) Download the QR codes list. Note that QR codes are generated for all the questions used in the game. So adding the ones you want to hand out to the beginning or the end of questions list is wise. A part of the printout you hand to the players will look something like this. As you notice, when you print out the QR codes, question intros are displayed on top according QR opening the specific task. For the game, it would be good to give teams pens, so they can cross through completed tasks. If no map is needed and you don’t use location based tasks, then this type of “items gathering” game concept looks the best with a clue game. 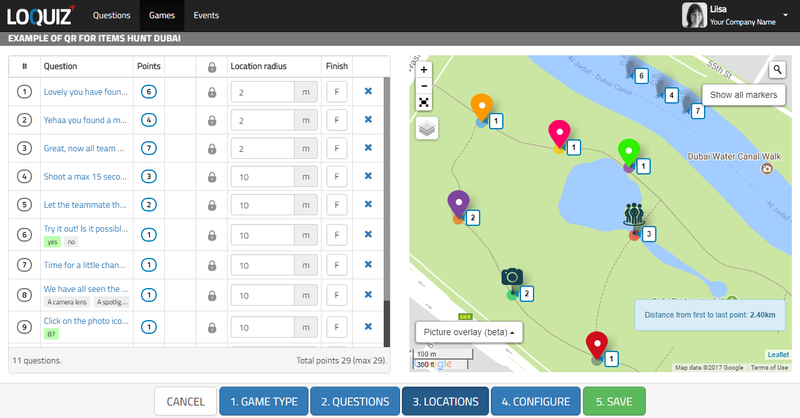 This example is done with the code words, but you can effectively use a combination of QR-s, beacons, codes, open questions and GPS location based activations.